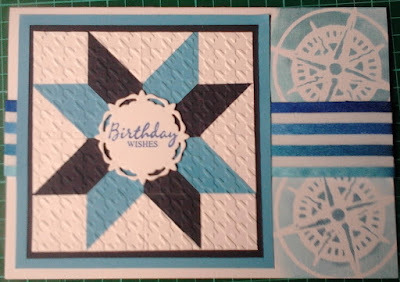 The idea for this card came after I watched the Quilt Card tutorial by Sue Wilson. I chose to use shades of blue as I am always being asked for masculine cards. However, as I didn't have the die that Sue used in her tutorial I had to do things a little differently! 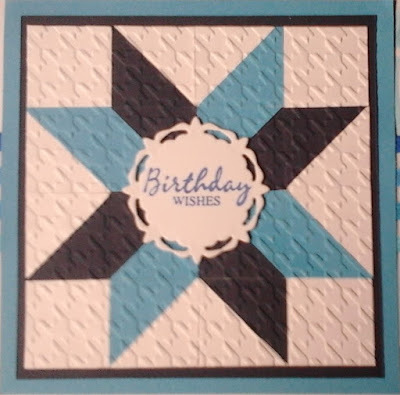 I started with white, navy blue and turquoise card and cut out 8 squares in white (2.5cm x 2.5cm), and 4 squares of the same size in each of the two shades of blue. I cut each of the blue squares in half on the diagonal and 4 of the white, leaving 4 squares of white whole. I then built up the pattern, gluing each piece into place on a 10cm x 10cm piece of white card, starting with the square pieces in each corner. Once I had finished the mosaic, I ran the whole panel through the Houndstooth embossing folder by Couture Creations to add texture. This was matted onto more navy blue card leaving a narrow border, and then onto turquoise leaving a wider border. I made an A5 landscape card blank out of a piece of A4 white linen card, and used the Tim Holtz compass mini mask with Broken China distress ink to add interest to the right of the card. The sentiment (Woodware - Salutations FRCL154) was stamped using Majestic Blue Versafine ink onto white card cut from one of the Nellie Snellen Round Lilly dies. Before sticking the mosaic panel onto the card blank, I cut another piece of white card (21cm x 4cm); wrapped a piece of coordinating ribbon from the ribbon sale at Berisfords round the card and tucked the ends under, affixing them at the back to neaten them. I glued the ribbon covered panel centrally across the card and then added the mosaic panel and the sentiment.